Sacrum is a triangular bone at the base of the spine, above the coccyx (tailbone) that forms the rear section of the pelvis. In humans it is made up of five vertebrae that fuse together by adulthood. It is located in the vertebral column, between the lumbar vertebrae and the coccyx. It is roughly triangular in shape and makes up the back wall of the pelvis. The female sacrum is wider and less curved than the male. 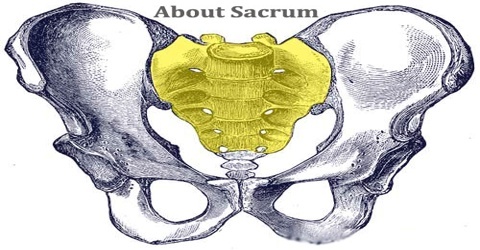 The sacrum is a very strong bone that supports the weight of the upper body as it is spread across the pelvis and into the legs. Developmentally, the sacrum forms from five individual vertebrae that start to join during late adolescence and early adulthood to form a single bone by around the age of thirty. 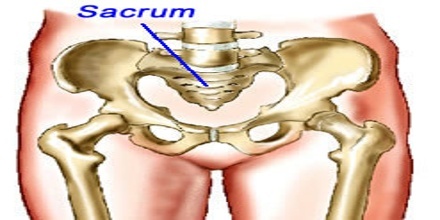 Sacrum is formed by fusion of five sacral vertebrae has three surfaces, a base and an apex. The body of the first segment is large and is similar to lumbar vertebra whereas the bodies of the next bones get progressively smaller, is flattened from the back, and curved to shape. The large, triangular-shaped sacrum (os sacrum) is composed of five vertebrae (S1 – S5) that fuse during early adulthood (18 – 30 years). The smaller coccyx (os coccygis) articulates with S5 and is also known as the tailbone. It consists of three to five vertebrae (C1 – C5) that are also usually fused. Many nerves of the cauda equina at the inferior end of the spinal cord pass through the sacrum. These nerves enter the sacrum from the vertebral foramen of the lumbar vertebrae through the tunnel-like sacral canal. From the sacral canal these nerves branch out and exit the sacrum through four pairs of holes on the sides of the canal called the sacral foramina or through the sacral hiatus at the inferior end of the canal. 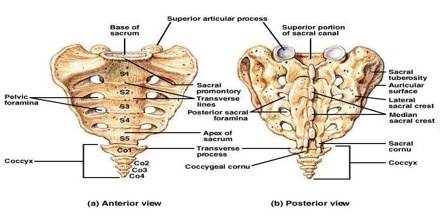 Sacrum is differently shaped in males and females. Female sacrum is shorter and wider than male sacrum, more curved and placed more obliquely backward. This increases the size of the pelvic cavity and makes the sacrovertebral angle more prominent. Several key muscles of the hip joint, including the gluteus maximus, iliacus and piriformis, have their origins on the surface of the sacrum and pull on the sacrum to move the leg. The sacrum also surrounds and protects the spinal nerves of the lower back as they wind their way inferiorly toward the end of the trunk and into the legs. Finally, the sacrum helps to form the pelvic cavity that supports and protects the delicate organs of the abdominopelvic cavity and provides space for a fetus to pass through during childbirth. Reference: medicinenet.com, dictionary.com, boneandspine.com, wikipedia.